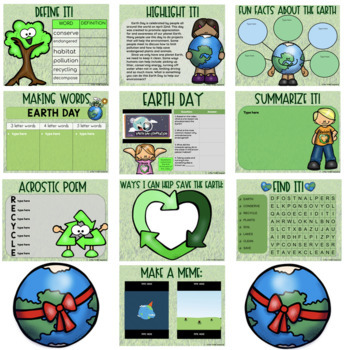 Need an engaging way for students to learn about Earth Day? 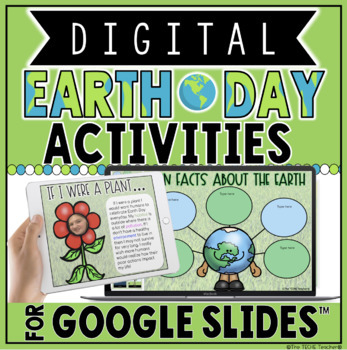 This resource contains 12 different digital Earth Day themed activities in Google Slides™ that are fun and paperless while remaining academic. Slide 3: Building Vocabulary Knowledge: Students can use a paper dictionary or the two online dictionaries that are linked into the speaker notes of this slide to define the words: conserve, endangered, habitat, pollution, recycling, & decompose. Slide 4: Paragraph about Earth Day: Students highlight the important information using the highlighter tool. Slide 5: Embedded YouTube video about Earth Day: After viewing the video, students type their answers in the right hand side of the table. After answers have been added the the table, students will use the magic reveal magnifying glass to uncover the correct answers that are hidden in the answer key that appears to the right of the slide. Slide 6: Fun Facts About the Earth: Students will visit the three different kid friendly websites that are hyperlinked in the speaker notes to research facts about the planet Earth. They will then type their 5 favorite facts using the text boxes provided inside the bubbles. 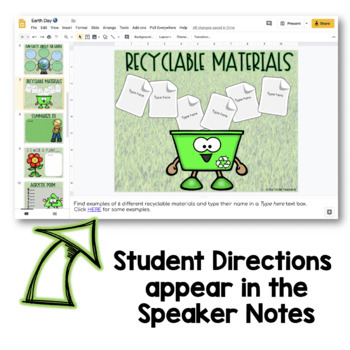 Slide 7: Recyclable Materials: Students will discover several examples of recyclable materials and list 6 on the images of paper sheets. Slide 9: If I Were a Plant: Students will take a selfie and crop to shape (directions are linked into the speaker notes) to place as the head inside of the flower. They will then type a paragraph about what they would do if they were a plant living on Earth. Slide 10: Acrostic Poem: Students will type an acrostic poem using the word RECYCLE. Slide 11: Make a Meme: Students can add text to the animated images to create memes. Slide 12: Ways I Can Help Save the Earth: Students will find images that represent ways they can help save the Earth to add to the inside of the heart. They also have the option to add text boxes to type in their responses. Slide 13: Making Words: Students will type 3 letter, 4 letter and 5+ letter words they can make from the letters in EARTH DAY. Slide 14: Find It! Word Search: Students can use the fill tool or line tool to mark words they find. Draggable check marks are provided for students to mark off the words they have found. All slides contain student directions in the speaker notes. This resource can be used on Chromebooks, laptops/computers and iPads. Great for any Google Classroom!